Today the Confederation of Cinque Ports serves a largely ceremonial role. But the ancient ties which bind these towns together tell a fascinating story, rich in anecdote and intrigue, set in a popular tourist area which includes dramatic chalk cliffs, the Royal Military Canal, the wild expanses of Romney Marsh and the much loved Romney, Hythe and Dymchurch Railway. 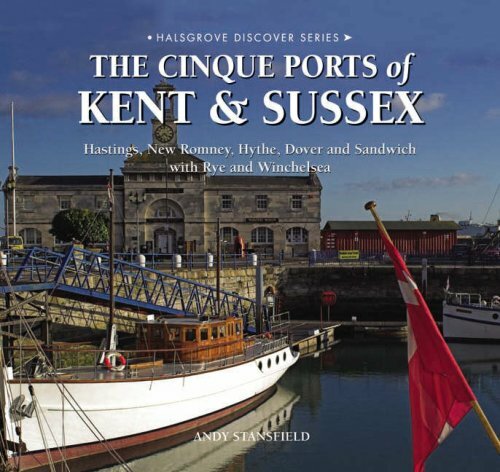 Dating back over 800 years, the Cinque ports originally consisted of a group of five towns along the Kent and Sussex coast where the English Channel is at its narrowest and the threat of invasion at its greatest. The original five (cinque) were Hastings, Romney, Hythe, Dover and Sandwich. Rye and Winchelsea were later additions. The towns enjoyed special privileges such as freedom from taxes and exemption from the jurisdiction of certain courts. The abuse of these freedoms led to a thriving trade in smuggling, wrecking and piracy which has given rise to many present day tourist attractions especially in Hastings. Well-known author and photographer Andy Stansfield paints a vivid picture of the rich past and thriving present of these historic communities, illustrated with over 100 superb colour photographs. Andy Stansfield is a Lancashire-based photographer, feature writer and author who specialises in travel and outdoor leisure. He is the author of The Forest of Bowland and Pendle Hill, also published by Halsgrove.